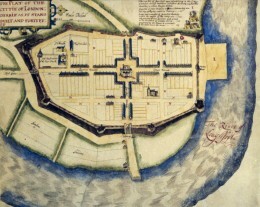 The project to digitally reconstruct the Great Parchment Book became a key part of the 2013 commemorations in Derry/Londonderry of the 400th anniversary of the building of the city walls with the aim that this key document to the history of the Plantation would feature as the central point of an exhibition in Derry’s Guildhall. The rest is history. The website which hosts the Great Parchment Book went live on 30 May 2013 and the exhibition Plantation: Process, People, Perspectives opened in June 2013 in Derry Guildhall. Both are still going strong. But we have another commemoration this year and that is the 400th anniversary of the completion of the city walls in March 1619. To celebrate the anniversary a full and vibrant programme of events, entitled Walled City 400 Years, will run until March 2020. The programme is being led by our partners on the Great Parchment Book project, The Honourable The Irish Society and Derry City & Strabane District Council, as well as the builders and owners of the Walls and The Department for Communities’ Historic Environment Division. The celebration aims to provide a great opportunity or both visitors and locals alike to experience the Walled City at its very best and includes historical exhibitions, symposiums, and living archaeology demonstrations and workshops.